2D not the greatest, but LOVE the gameplay! Ok, the graphics are old fashioned, yes. But I love the challenge of the gameplay! It's not just boring old Match 3! You have to make sure you match them just right to get rid of the colored border, and that, at times, presents a challenge! I wish I could find a LOT more like this game I LOVED it! I admit that the match 3 was different, as mentioned in the other reviews. But after playing the one hour trial, I had one word for it -- Boring. Yes, things did appear as I progressed, but that was disappointing. Why can't the player buy or build the houses and gardens? That would add to the entertainment value. The boards did get progressively challenging as I moved forward, but there was nothing to break the monotony -- clear a board, see your score, clear another board and on and on and on. Trophies were awarded. One was a key to supposedly unlock things as I went along. In the one hour trial, I had no use for the key. 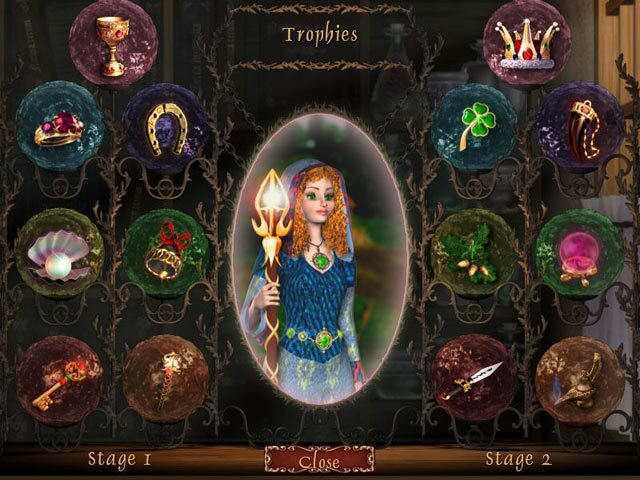 Another trophy was to ward off evil spirits. Again, I never used it. I like match 3's where you accumulate money and can choose items to buy to create something, i.e. Flower Paradise (create gardens in various locations) or any in the Fishdom series (create underwater scenes). I guess that is the key word -- create. Great graphics in this game; the screenshots don't do them justice. The matching is a little different. Your primary task is to create flower matches that correspond with bordered tiles. For instance, making a match of pink flowers that includes a tile with a pink border. 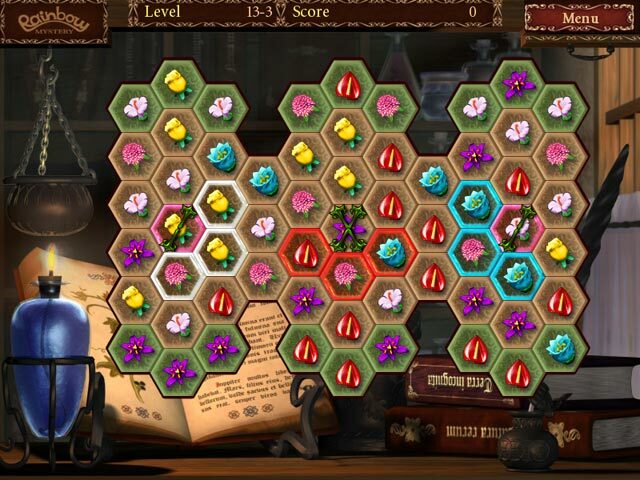 To do so, you have to finagle the right flowers onto their corresponding tiles, and that is what makes the game more challenging than the average matching. The secondary task is to turn the tile backgrounds green, although you don't have to complete that to finish the level. Some levels have you dropping a magic tool down the game board. 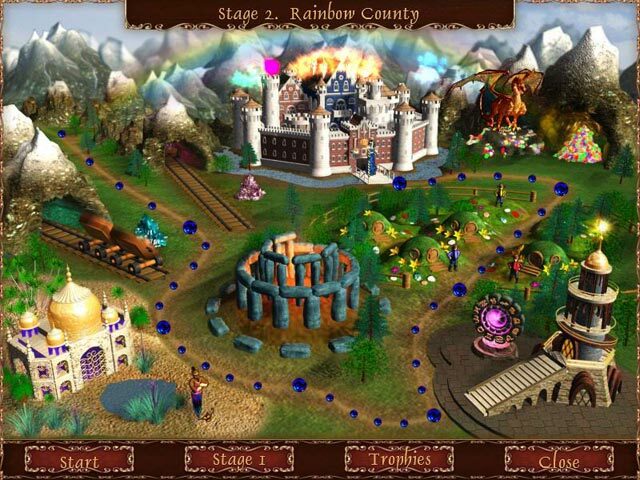 At the beginning of the game, the fairy is standing before an empty landscape, but as you win each level, the fairy takes a step forward along the path, and various parts of a town start to appear out of nowhere. Characters also appear magically. It's that part of the game that can be addictive, at least to me. You want to keep playing to see what will pop up next! An entertaining game for anyone, kids and seniors included. I can only sum up this game in one word..."nice". The music was "nice", the graphics were kind of stiff and 2-D..."nice", the level of difficulty - there were several levels of game play....relaxed, timed etc., again, "nice". For me there were 2 major irritants - while the flowers were rearranging themselves you couldn't make any other matches....which is annoying when on the timed level. And the object of the game is to match the different colored and varieties of flowers to match 3. Then there are boards where you have to get an object down to the bottom of the board and all the boards have locked cells that you have to unlock by maneuvering the correct flower into it. The background of the board also turns green as you make matches over the cells - however, if you unlock the cells before turning the background all green, the game automatically closes the board and you "win" the level....without turning the background all green! I hate that! It feels like I left something unfinished and should have/could have done better! Hello? OCD anyone? But really, anyone that is a perfectionist will be annoyed!! It is a relaxing "nice" game if it's a daily or weekly deal, or some other special offer, however, I don't think I would spend the full amount for this game, even though it's "nice"!